They’re off and running at the tenth annual Rodney Myers Memorial Run Around Egg Hill race in Spring Mills. 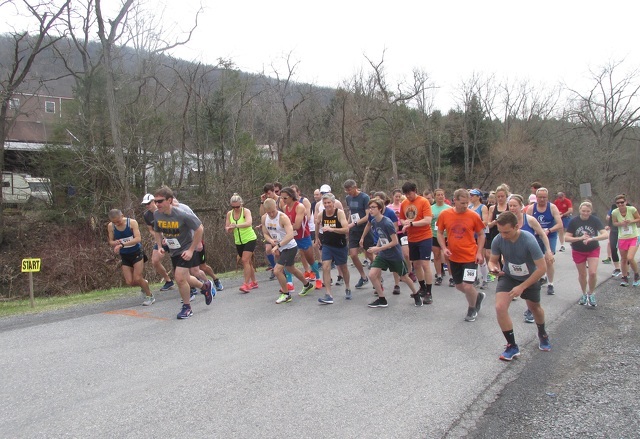 SPRING MILLS — The tenth annual Rodney Myers Memorial Run Around Egg Hill was held on April 7 in Spring Mills. This race is held in memory of Rodney Myers, who was a Penns Valley High School wrestler, and an avid runner who often trained in the Spring Mills and Egg Hill areas. Myers passed away in 2005, and the race was established in his memory. The race is supported by more than 20 local businesses and proceeds from this event are used to support the Penns Valley High School track and field and cross country athletic teams. The race also provides some scholarship funds for Penns Valley cross country athletes. About 50 male and female athletes, ranging in age from pre-teens to senior citizens, competed as individuals in six age groups. There were also relay classes for team participation. At 2:30 p.m. the runners gathered at the starting line on Sinking Creek Road, just west of Spring Mills. The starting gun, a Civil War-era cannon, was fired by Jimmy Brown, from Hampton’s Battery F Civil War reenactment group, producing a loud, echoing boom and a thick cloud of smoke, to begin the race. The race course took the runners on a 10-mile loop, beginning on Sinking Creek Road in Spring Mills, then proceeding through the town to Upper Georges Valley Road, westward to Egg Hill Road, passing the historic Egg Hill Church, and then back to Sinking Creek Road, to the finish line near the Old Gregg School Community Center. Race organizer Jodi Butler, who is Myers’ daughter, said that the race follows the exact route used by Myers as a marathon training route years ago. Race results were tallied by Dave Eggler of the Nittany Valley Running Club, and prizes were given for first, second and third place in each category. This race attracts runners from the Penns Valley area as well as some from outside the area. Among the runners this year were Paul Trutt and his son Isaiah from Milton. Paul Trutt is a veteran runner, having competed in many races, including marathons, since 1980. Their plan was to run a three-man relay team with Paul Trutt and his sons Elijah and Isaiah, but Elijah was unable to attend so Isaiah ran two of the three legs of the race. Isaiah is a ninth-grade student at Meadowbrook Christian School in Milton where he is a member of the school track team. The Trutts took first place in the families’ teams category. The overall winner in the men’s division was Shundai Li, 45, of State College, with a time of 1:01:17. Anna Squicciarini, 40, of State College, was the women’s overall winner with a time of 1:15:42. Men 20-29: Kyle Houser; men 30-39, Michael Zimmerman; men 40-49, Andrew Maguire; men 50-59, Costas Maranas; men 60 and over, Martin Mazur; women under 20, Catherine Bierlein; women 20-29, Elizabeth Hansen; women 30-39, Laura Tyson; women 40-49, Aimee Brough; women 50-59, Lynda Federinko.